Every season Love Niche stages a runway show in Newcastle to showcase their latest collections and SS16 was no different in that respect. It was however, a huge departure from the regular Love Niche runway show, SS16 brought with it a record number of outfits and a brand new venue. Following in the footsteps of Karl Lagerfeld, the GodFather of Chanel, Love Niche Owner and Curator Nisha Vedhara, decided to inject a little bit of Paris Fashion Week into her latest show and give every guest a seat on the Frow. That’s right Voyeurs, no rows other than the front row and all named after the fashion capitals of the world. Natch. You’ll know by now from past posts that Nisha and I have become good friends and I champion each collection she brings to the Fash Pack of Newcastle and beyond. A thoughtful designer, Nisha designs for everyone, every shape and every size, there aren’t many places that can boast a bespoke service with such wide appeal and Nisha’s studio and respective lines have that in abundance. Nisha learned her trade from her mother, watching her pattern cut and create designer led pieces in India, she designs and produces her own collections “Luxe” and “Resort” and travels the world sourcing and buying the best pieces for her Love Niche “Paris” and “London” lines, ensuring there is a price point that all clients can shop, without exclusion. Petite, beautiful and very in demand, Nisha is warm and friendly and probably knows what you want more than you do. In fact, she’s so in demand that she’s the Stylist that Brazilian model and Victoria’s Secret favourite Adriana Lima has on speed dial when an assignment comes up and she needs the best. Ok, back to the clothes, Love Niche show off schedule, this means that as the collection is shown, clients are able to shop it right off the runway, no waiting six months for the drop to hit the studio, what appears on the runway is current and relevant to the season we’re in. So, scheduling lesson over, let’s fast forward to The Art of Style, the name of Nisha’s latest runway show at The Biscuit Factory – an art gallery in Newcastle that oozes cool and the perfect place to stage a runway show. On arrival guests were greeted with a cocktail and a smile, and with a dedicated selfie zone and pop up shop, the stage was set for Love Niche’s most ambitious show to date. I wore a hacked up ballgown, a Pearl Jam tee and a Kathryn Russell Country Garden crown – perfectly mismatched chic with an Apple Watch which I’m quick discovering goes with nothing but gym attire. With everything from resort wear suitable for cocktails by the poolside, through to full length gowns fit for the red carpet, and fun, flirty fashion for the younger client, Love Niche put on a showcase lasting a full 60 minutes broken down into themes and styled with accessories from the Love Niche Details range, carefully curated by Nisha herself. Models walked the snake like runway ensuring that all guests were treated to a 360 degree view of each outfit, up close and personal, exactly as it should be and were able to shop the exact pieces right there from their seat on the Frow. With bespoke headpieces, flower crowns and section grips provided by the insanely talented Kathryn Russell, the show had a real flavour of Sicilian glamour, a la Dolce and Gabbana. 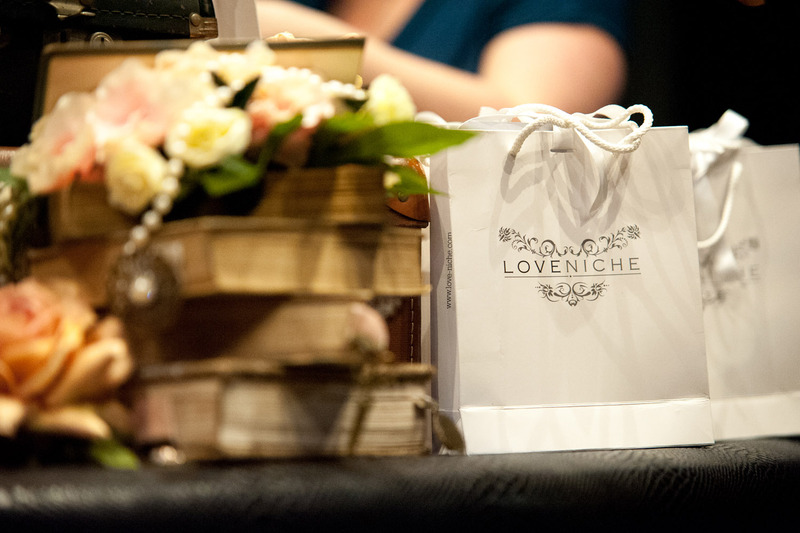 If you’re already familiar with Love Niche, you’ll know that a Love Niche runway show needs no introduction, a glamorous affair in some of the best North Eastern venues and a sell out every time, but what you might not know is that Nisha and her talented team offer a bespoke made to measure service. Dotted around the venue were framed sketches of beautiful gowns coupled with swatches of fabric, after the show Nisha tells me that these are all sketches of real dresses which she created for real people. Nisha tells me her bespoke Love Niche clients come back time and time again and I’m not surprised; the Love Niche Studio, tucked away on Clayton Street Newcastle is pure escapism. Once you climb the staircase and are buzzed in, guests are welcomed with a glass of champagne and you feel a million miles away from the hustle and bustle of the city centre. It’s a calm and welcoming environment and the team are on hand to dispense advice where needed, there’s no push for a sale, it’s a great place to shop and it’s no surprise that Nisha has many a celebrity client given the level of privacy the studio offers. If you haven’t yet discovered Love Niche, then make it your next shopping destination, if only for a browse and if you can, get to the next big resportwear show Kool and the Kaftan at Ramside Hall in May 2016, it promises to be another fashion extravaganza and if you have a vacation planned it’s a great way to get the jump on SS16′ s best swim and pool wear offerings. You can thank me for this tip later!